A man who paid $350,000 to shoot a black rhino is now suing an airline for refusing to ship his trophy. 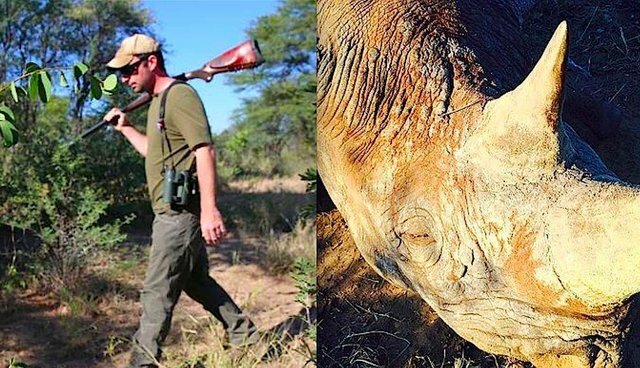 Corey Knowlton, who won a permit for the hunt from the Dallas Safari Club back in 2014 and made the trip in May 2015, made headlines when CNN decided to go along with him on his hunt for an endangered black rhino in Namibia. "I feel like from day one it's benefitting the black rhino," Knowlton told CNN after he shot Ronnie the rhino. "And I'll feel like that until the day I die." "Other than Walter Palmer himself, I cannot think of a less sympathetic plaintiff to challenge Delta's common-sense policy than Corey Knowlton - the Texan who paid to kill one of Africa's rarest black Rhinos," Chris Green, of Harvard Law School, told The Dodo. "No rational airline ever would want to be associated with transporting this endangered animal's butchered body out of Africa just to go hang on some rich American's wall." Knowlton claims that Delta's new policy makes it seem like "America's business, professional, and civil leaders" are "lumped with traffickers." Hunters say that money is what makes their killing justified, compared to wildlife traffickers and poachers. That the money hunters pay to shoot endangered animals ultimately protects them is a common claim trophy hunters use to justify killing animals who are already being slaughtered at incredibly alarming rates. But this claim ignores the devastating effects the death of an individual animal can have on the bloodline and the animal's existing family members. Further, with animal populations plummeting from loss of habitat to poaching, trophy hunters still kill an estimated 105,000 animals in Africa every year when every individual is crucial to the survival of the species. "Stunts like this only draw more negative attention to an already controversial cause. The public response to Knowlton's lawsuit will confirm to Delta Air Lines that it did exactly the right thing by listening to the majority of its customers and refusing to participate in the recreational slaughter of Africa's precious wild animals," Green said. He added: "Endless people can travel to visit a rare African animal during its lifetime - creating a renewable source of tourist dollars that cycles through a local economy over and over again. Yet no matter how high the price, only one person can kill a black rhino and then it is gone forever, just like Cecil." In just 40 years, the black rhino population has been decimated because of poaching and hunting. Today, according to CNN's coverage of Knowlton's hunt, there are just 5,000 rhinos left in the world. According to other estimates, there are fewer than half that: Just 2,500 black rhinos left on earth. CORRECTION: A previous version of this story said that Chris Green was with Animal Legal Defense Fund (ALDF). He's with Harvard Law School.